Ferrari are ready to "challenge the impossible" with Lewis Hamilton on the brink of a fifth Formula One title at this weekend's United States Grand Prix. 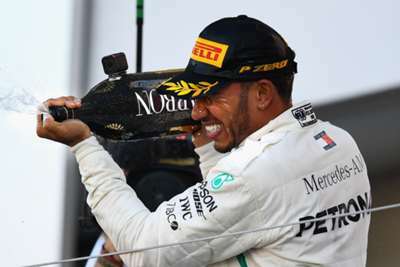 Hamilton has won six of the last seven races to open up a 67-point advantage over Sebastian Vettel in the drivers' standings and put himself on the verge of retaining his crown. If the Mercedes driver triumphs in Austin and Vettel finishes third or worse, the Briton will match Juan Manuel Fangio's haul of titles and stand two away from drawing level with all-time great Michael Schumacher. However, Ferrari chief Maurizio Arrivabene is unwilling to down tools in the face of Mercedes topping the standings for drivers and constructors for the fifth straight season. "I know that the situation looks impossible, but our job sometimes is to challenge the impossible. This is what we're going to try to do," Arrivabene told Sky Sports. "We win and we lose together." Vettel finished sixth behind team-mate Kimi Raikkonen in Japan last time out and Ferrari need a much-improved display to keep the title race alive until the following grand prix in Mexico. Sauber driver Charles Leclerc could be forgiven for already looking forward to next season, when he will be in the red of Ferrari. However, he is under no illusions about the expectations he anticipates being placed upon him. "If I'm not good enough next year, I should be dropped by Ferrari and this would be completely understandable for me," Leclerc told the Beyond the Grid podcast. Daniel Ricciardo does not just have racing on his mind, putting on an American accent to tell the official F1 website: "The food is something special. I love my ribs, my brisket and boy, they got nachos coming out of their tachitos. What's a tachito, I have no idea!" Haas have impressed in the midfield this season and sit fifth in the constructors' standings. Another positive result in Austin – the team's home grand prix – would mean a lot to Kevin Magnussen. "There's absolutely an extra will, or motivation, to do well in the USA. We always try our best. We're always on maximum attack to get the best result possible," said the Dane. "It just carries a bit more significance to get a good result in America and at our home track. America's obviously not my home country, but you feel like it is racing there that weekend." The USA has used more circuits than any other country in F1 (10).